(TBW) Note: TBW is NOT total body weight…!! Factors influencing this number include – Age, and obesity. The older and more obese – The LESS the total body water is a % of Total Body WEIGHT. This makes sense because the more fat cells you possess the more they will contribute to the TOTAL BODY WEIGHT and LESS of it will be attributed to TOTAL BODY WATER. Extra-cellular Fluids account for approximately 1/3 of Total Body Water. 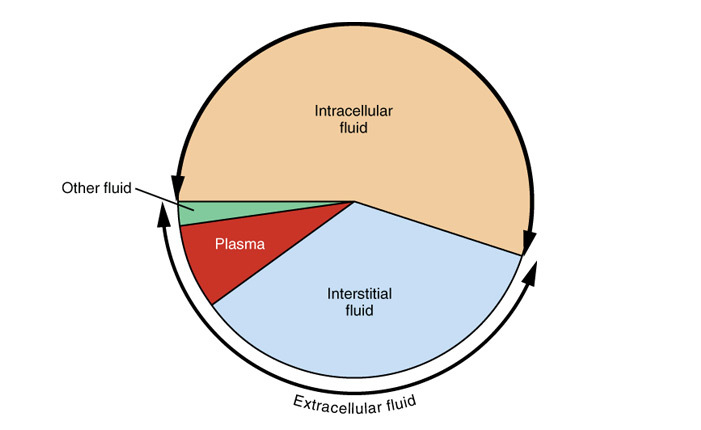 Intracellular Fluids account for approximately 2/3 of Total Body Water. Daily Sodium and Potassium Requirements = 1meq/Kg of body weight per day K+ excretion is due mainly to secretion of K+ after filtration. Osmolarity is a measure of the number of Solute particles per solvent. Normal Osmolarity is around the 300 Range. Based on the equation Na accounts for over 75 % of the Osmolarity. Typical Value for Na is 140 = 2x that is 280 there is your osmolarity right there. When assessing sodium concentrations in the blood one must understand an important concept. Do not Confuse Natremia with osmolarity. THEY ARE DIFFERENT !! In cases where there is elevated Dry weight due to disease and the Dry weight is increased to say 14% then, the laboratory will give a reading of Na levels that are low, ie 130/860 cc will be read as 130meq/L but in actuality its the same as 140/930cc which is 151 (Do the math) Thus this is Factitious Hyponatrimia. Ok Normal is 140/930cc which translates to 151meq/L but it is READ as 140/L by lab machines. Now if we have normal Na concentrations 120.4meq/L in a volume of 860cc this gives 120.4 meq/860 cc But it is READ as 120/L thus this Shows A LOW NA+ [ ] when in Actuality it is NORMAL. This is a situation of Na concentrations less than 135 meq/dl and there is elevations of glucose levels as seen in diabetics that cause the osmolarity to skyrocket. For every 100mg/dl INCREASE in GLUCOSE there is a 1.6 meq/dl DEC in Na Concentration. The elevated Glucose also pulls in water so that’s why sodium levels go down. NA values are fine but Water is excess ( dec in [NA+] This can be rather confusing because the Na+ Content may be fine or high but because there is a disturbance in the volume of Water it may dilute the sodium to low levels, IE in cases of CHF, LIVER DISEASE , NEPHROTIC SYNDROME, all cause this. Symptoms of HYPO-Natremia with HYPER-Volemia include ascities, Edema. A decrease in intravascular Oncotic Pressure as seen in cases of Nephrotic Syndrome (due to proteinuria), can lead to edema in the legs, Facial edema may also be evident by a puffy face and droopy eyes. There is a decrease in urinary Surface tension due to the presence of urine and the urine becomes frothy (A Dipstick Test is helpful in making the diagnosis of proteinuria). the Na loss is greater than the water loss leading to HYPOOSMOLARITY. HypoNatrimia with ISOVolemia, occurs in cases of Syndrome of Inappropriate ADH secretion (SiADH) , as well as renal failure. There is no Presence of Edema because The volume is normal but that doesn’t mean that there isn’t an increase in Interstitial Fluid, just not enough to be Noticeable ( remember edema is a visual sign). Treatment – Will depend on the severity of the abnormality. In most cases, the first component of treatment is Fluid Restriction. If fluid restriction cannot correct the Hyponatrimia, THEN DEMOCYCLINE SHOULD BE INITIATED. BUT FIRST TRY FLUID RESTRICTION. IF However, the Hyponatrimia is SEVERE IE BELOW 115mg/dl THEN SLOW INFUSION of HYPERTONIC Solution will dictate Treatment. K+ is present mainly within the ICF at a concentration of about [ 150] ECF values range from 3.5-6.4 Plasma Values of K+ equal 3.5-4.5 Insulin, Alkalosis, (vomitus ) Aldosterone, 􀃆 DEC Intracellular Uptake of K+. This is defined as a condition where plasma values are less then 3.5meq/l, in conditions of Alkalosis K+ is exchanged with H+ Ions to shift the balance. In cases of increased insulin, Glucose is transported using a K+, Glucose pump. Thus Insulin acts to influence up regulation of K+. Diuretics also work on the same mechanism in the Distal Tubule, There is elevated exchange of Na+ for K+. GI Disturbances can lead to K+ loss in the stool but they also contribute to the Na+, K+ pump within the kidneys. A Condition which is seen in Serum specimens due to the coagulation of blood that leads to a release of K+ by the White Blood Cells, There is no elevation in serum levels, This situation occurs when WBC and Platelets are elevated greater the 500,000/ ml. This is very important. In patients with hyperkalemia, the heart is a very vulnerable to excess K+ floating around in the blood. So the next step in patients suspected of hyperkalemia is to give CALCIUM GLUCOCORNATE. It protects the heart from life-threatening K+ induced arrhythmias.